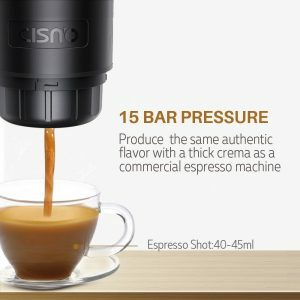 Black Cisno NCC-N01 is an electric, single-button operation, portable espresso machine with 15 bars of pressure. It works with a rechargeable removable lithium battery and is able to heat up water up to 195 degrees Fahrenheit quickly to extract coffee at the optimal temperature. It is a hot new release coffee maker that was first listed on Amazon in January 2018 and is rated 4.8/5 stars by six customers on the day of this review. It includes the heating discs, a temperature probe, a filter screen and a maximum water level indicator to help you in the process of making a great cup of espresso. With a 15-bar high-pressure pump, the delicate flavor and premium dense cream and aromas it generates during the brewing could be compared to that of a much more expensive commercial-grade espresso machine. Black Cisno Espresso Maker weighs just 2.1 pounds (2.4 lb. including the charger) and measures 3.1 x 9.9 x 3.3 inches. It has a compact size and streamlined design so you can easily put it in a bottle holder in your handbag or backpack when you’re going away for outdoor activities like camping, hunting, fishing or hiking or cabin luggage when you’re traveling. It is compatible with and suitable for use with the genuine original Nespresso and Sealed reusable stainless steel capsules for ground coffee. And you can also brew tea or mint, make your own favorite beverages. If you’ll be using the SealPod reusable stainless steel capsules please take out the silicone rubber ring seal not to bend the needles. It is very easy to operate and you can use either cold or hot water with it as it is able to heat up the water. With cold water, you need to press the button for two seconds and wait up to ten minutes for heating. And with the hot water, you just press the button for five seconds and you can have your coffee instantly. It is easy to clean up as you just need to run it empty- without putting in a coffee capsule to clean off any coffee residues. And the rechargeable battery is quite convenient when you’re on the go as you can even recharge the battery in the car with the 12V car charger or use it with the power from the car adapter. An AC adaptor to charge the battery pack and a 12V car charger that can be used to heat and pump the coffee are included in the package. You can make great tasting espresso when you’re outdoors, sit in your backyard, in the park or anywhere you want. The removable lithium battery with 18650 battery cells that offer non-stop power source to the espresso machine can be recharged by as much as 10,000 times. At full battery charge, you can make up to 100 cups of espresso by using your own boiled water or up to three cups by cold water heated by the espresso maker. The battery can only be charged internally inside the espresso machine and not externally. 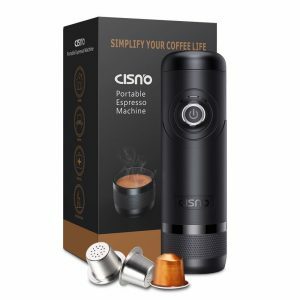 Cisno Espresso Machine is not really cheap for a compact espresso maker and for the design but for the quality of coffee, ease of use and portability it is well worth the price tag. It is a major step up from instant or plunger coffee as the taste and texture of espresso and cream are comparable to barista style coffee machine. To get better tasting coffee you may want to preheat the machine by running hot water through it as the pouring temperature is 185 degrees Fahrenheit. The fact that you can use it with Nespresso pods or regular ground coffee makes it quite flexible. For those that are on the market for a portable espresso maker that makes great tasting espresso with beautiful cream, this one is well worth considering.